Im trying to first clear an existing chip (old Audino chip) and put the nerdkits bootloader on there. Ive installed the drivers and everything seems to be ok (2 green lights). You need to specify the baud rate and comm port on the avrdude command line. Think i may have solved it - being an old Arduino chip i think the RSTDSBL fuse is enabled, How can i disable it ? Assuming the chip is not fried, you will need a high voltage parallel programmer to make that change. What type of PC are you using? I am not familiar with a comm port named "usb". windows 7. the mkii doesnt make a virtual com port. It is possible to make a parallel programmer and it is a lot of fun. All the necessary information is in the datasheet. Making your own will take a while so if you don't have the time or inclination, Ralph has a parallel programmer that runs about $50, the AvrDragon I think. I took a quick look on the internet for "avr mkii usb avrdude" and there appear to be issues with usb driver conflicts for the mkii on windows when Amtel Studio is installed and then trying to use avrdude. I live in the UK so its closer to £50 over here. Ive tried it with my current nerdkit (which i know the reset line works) and its the same issue. It's really hard to tell from your photo exactly where the key is in the 6 pin connector but it looks (based on the red side of your IDC cable) that it could be wired wrong. This photo illustrates what each pin is for the PIN HEADER (The part connected to your breadboard) if you were looking into it. So if you were to hold the connecter that goes to your breadboard, where you are looking at the pins with the key slot on the left, pin 1 is upper left. Again, it's hard to see the key but the red striped side of the IDC ribbon cable usually indicates the pin 1 side and if that is the case, things look to be connected wrong. The Yellow wire goes to the 4th from the bottom on the right hand side (PB4 - MISO) which seems to match ? I can make the top light flash orange if I replace the resistor on pin 1 with a wire. Which seems to be what should be expected ? Yep, I got things flip-flopped in my head. Looking at it again, it does look correct. 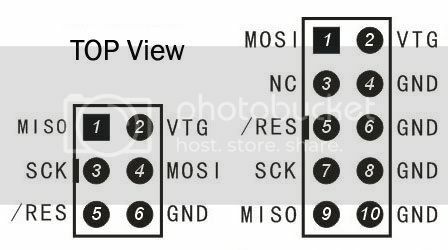 What value resistor did you use on pin 1? Looking at your photo's it looks to be a 1K5, you could try a 10K instead. Maybe your programmer is having trouble pulling the reset line low. Other than that, you could try either a USBASP programmer or build your own using NOTER's code to see if they work. I Use a USBASP type programmer for all my ISP programming and from Windows XP thru Windows 8 have never had an issue. I've read of several issues with the AVRISP and clone programmers in Windows especially Vista and beyond. Found a 10k one. Still not working. Im going to try with Linux see if that helps at all. The 7k8 should be enough. I wouldn't think that'd be the issue. It seems to be leaning more to the programmer. Also, I was reading through this post, you were at one point suspecting the reset disable fuse had been programmed, but then noticed that your programmer wasn't working on another (NK) chip. I would agree that the issue isn't likely the reset fuse being set, that would be very unusual and not standard for any variety of arduino I'm familiar with. I think the alternative programmer would be the way to go (Unless you are determined to use AVR-Studio which is tied to their programmers). You can get a USBASP type programmer on ebay for a few dollars US from Chinese sellers. You could probably source one in the UK for not much more through e-bay. Or, you could build your own as Noter has shown. This would at least put you in the realm of platforms several of us have used that are known to work. Would that one be ok ? HK will take a few weeks to deliver this one is based in the UK. I would prefer to have a dedicated programmer than one i have built really. I was reading though some help guides and it was mentioned that some people will set the fuse to give the extra IO port. I didnt own the chip before it was an arduino so i wasnt 100% sure of the history. It does work though. That one should work fine. One other thing, before giving up on the current programmer. Does that programmer power the chip for programming, or does it require the chip to be powered externally? It looks like you are supplying power from your board. I know with my programmer, I can power the chip at the board or provide power from the programmer. Maybe try removing the power at the board to see if the programmer powers it. If it does, try programming again with only programmer power... Just a thought before you make another purchase. The second light shows the power status of the board. When trying to program without in AS6 it says "Target power needs to be between 1 and 5.5v"
It reads the power ok. I can connect to the mkii (i upgraded the firmware fine) and the USB light is green. I can force the second light to blink orange by removing the resistor and replacing with just a cable. Could be faulty. Maybe they had a bad batch?? Hopefully the new programmer will get you going. Got the one from ebay yesterday. It worked right away. Provides power too so thats 1 less thing to worry about. Flashed the chip no problems at all. Looks like it was a dodgy cable ! I have had a lot of good luck with the USBASP programmers, I'm glad that it worked for you too.